This. My beautiful artists of all persuasions, a storm is coming. A hurricane of creativity, a storm of cleansing rains, a refreshing rainbow of rebirth in a safe haven of beauty. I am a new moderator to this incredible movement. OH BOY! The Activate Your Life! 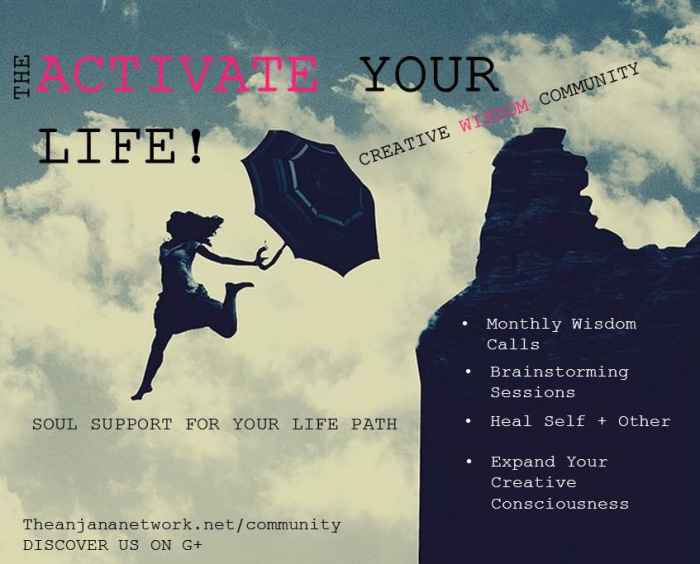 Creative Community is an interactive empowerment group to help you, the conscious artists recharge, connect, share and develop the soul wisdom it takes to make your (REAL) life unfold. In this group, we hold the space for spiritual seekers looking for meaning in the mystery. We offer support for energy workers and wellness enthusiasts with holistic wellness discussions. We witness the unification of powerful beings who know they are destined for the path to greatness, who look for abundance through the struggle, and always expect the best outcome of their efforts. This is a call to home base. Connection – Be heard and healed on monthly wisdom calls with Anjana. Community – Discover a support system of whole-hearted dreamers, seers, feelers, and doers.